I love making all of these blocks for all the quilting bees and swaps that I have gotten myself into. It is great to work with different fabrics and to think of new ways to express myself through sewing. Saranya, from the Sew Connected 3, sent me gorgeous fabrics that are my favorite color combo - pink and green! I know Saranya lives in Thailand and I wanted to focus my blocks on that, especially since my husband lived in Thailand for awhile and loved the people. Elephants are Thailand's animal and I love them, so that was my inspiration. I finally used my elephant fabric from Alexander Henry. It is one of my favorite prints and thought it was perfect for this block. Then I embroidered elephants because, as you all know, I love to embroider. This block was inspired by this block. Ric-rac framed the elephants nicely, I thought. Another Sew Connected 3 block. Who would have thought that this block would be one of my favorites and that I REALLY do not want to part with it?!?!? I hope Donna aka Rocklilly likes it. Remember this post? 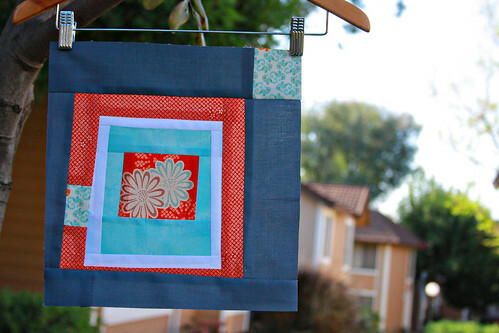 I made my block for Chen using the Brooke sheeting fabric she sent me for our swap. The owls are just soooooo cute. These are my best corners yet!!! I don't know how I got the 4 corners of the squares to all line up. Whoo Hoo! Oh! I love them! What beautiful fabric combinations. 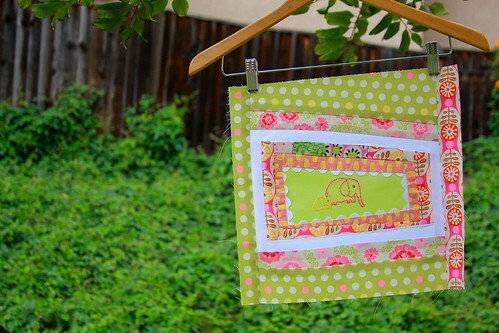 If you're not completely weary of them, check out my Spring Swap. I'd love to have you join in! These are fantastic. 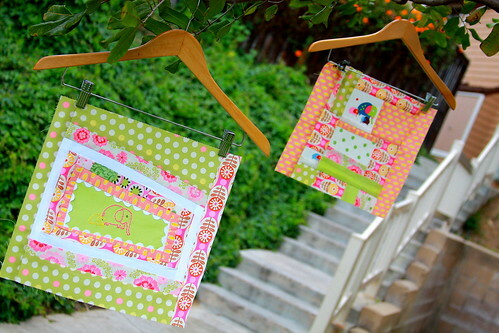 I love how you used the rickrack and did embroidery in your blocks. Who wouldn't love these? I do not know what to say, your blocks are amazing, pink and green are my favorite too, I know anyone would be thrilled to get a block from you!! I love the owl fabric!! I am so in love with your blocks. I LOVE the ric rac and the elephants. Darci, I LOVE my block. Thank you so much! Cute! Are elephants the new owls? 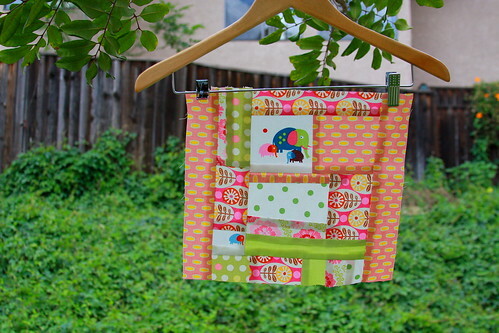 I just put some on some baby tees and burp cloths! Cute blocks,,,,nice weather,,,we have snow today! 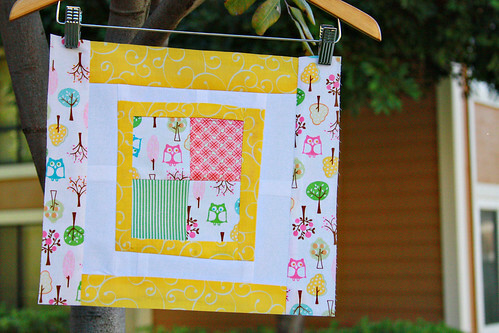 I loved the pink Cottage Quilting Bee quilt on your green grass! Love those blocks! The owls are particularly cute. And your elephant embroidery. Wow you have been a busy bee. i love all your blocks. the owls and the elephants, just too cute!! and so bright and cheery. 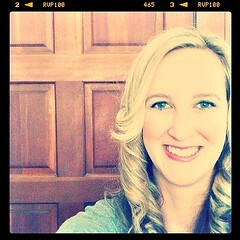 I'm ready for some warm summer days now!! Beautiful blocks! 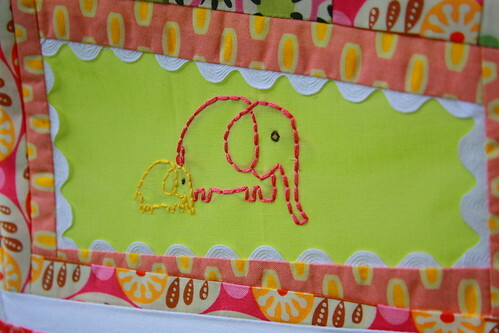 I really love the embroidered elephants - I guess I'm going to have to learn to embroider! Oh...I can't wait to see about your giveaway...especially if Lush is involved! very cute! love the green grass and the sunshine too! These blocks are so gorgeous! I'm in love with all of them. Love the embroidery. I've blogged my attempts at embroidery too, but they aren't as good as yours. A friend showed me the "split stitch" once and that's all i know how to do! Complimenti! Sono bellissimi i tuoi lavori, i colori che usi, gli abbinamenti!